Blueberry lemon muddy buddies are ready in a pinch: No Waste! 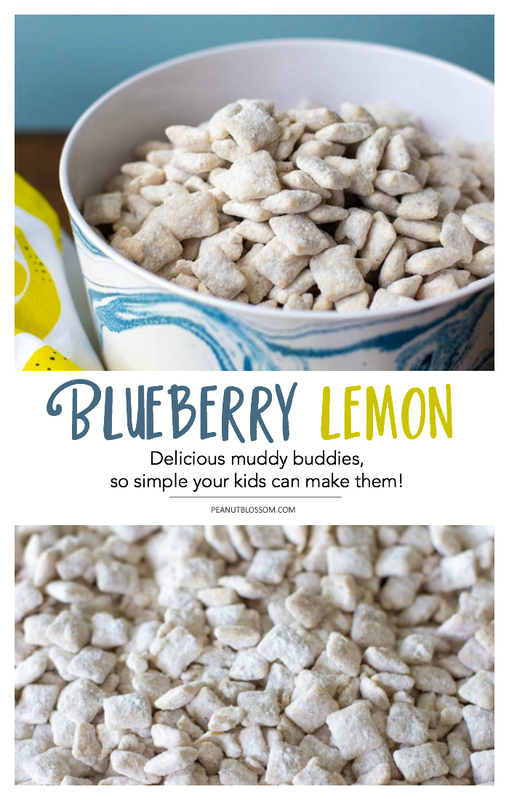 These blueberry lemon muddy buddies (or blueberry lemon puppy chow, however you choose to call it) are one of our all-time favorite muddy buddies flavors. This puppy chow recipe is a totally addictive and easy dessert recipe to bring to your next potluck. Thanks to General Mills for sending us this fun summer treat kit. Don’t miss our other favorite sweet and spicy treat: Honey Sriracha Chex Mix Recipe. A few weeks ago we were invited to an impromptu backyard grill out by a family at our church. They told us they had everything covered for dinner, but like a good guest I didn’t want to show up empty handed. I had the ingredients for blueberry lemon muddy buddies sitting on my counter thanks to a recent goody package from General Mills. 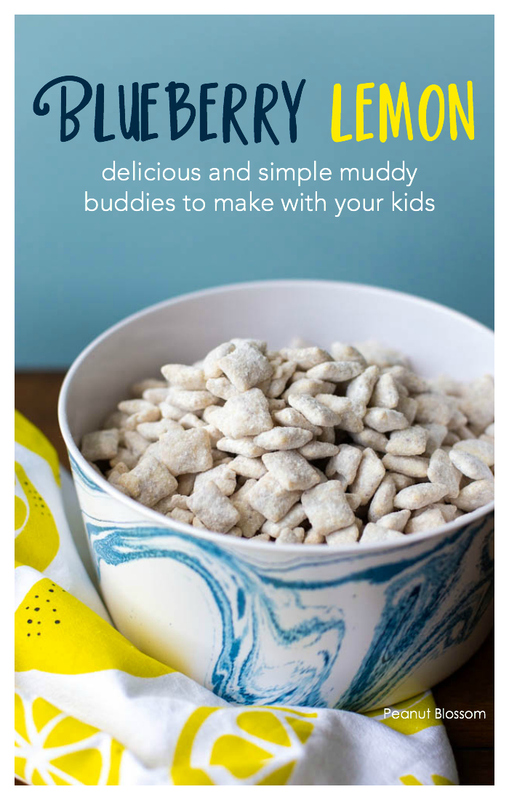 I know how utterly addictive this particular muddy buddies recipe is so I didn’t want to make it just for us or I knew I’d eat it all by myself! The party was the perfect excuse to finally shake them together. With the bbq party starting in just a couple hours, I loved that all the ingredients were on hand in my pantry and ready to go. It’s the perfect last-minute dessert recipe to keep around for entertaining emergencies. With cooling time, the recipe is ready to serve in 30 minutes but it only takes 2 minutes to make. Even better, it uses up an entire box of blueberry flavored Chex cereal so you don’t have a random bit of cereal remaining afterwards. 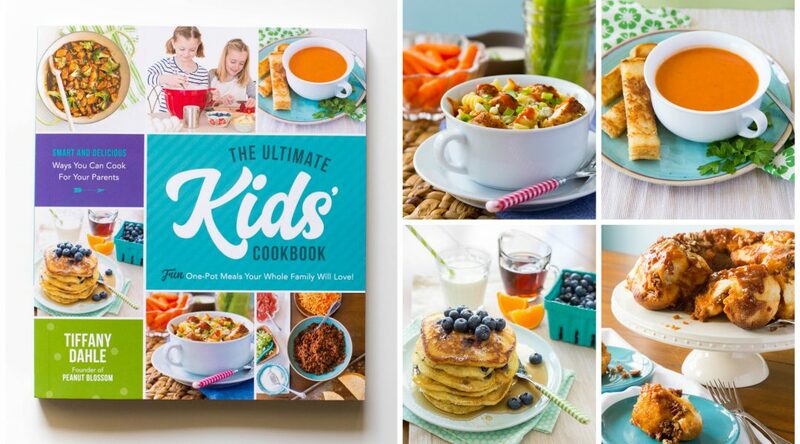 It’s a great recipe for clearing out your pantry, too. Our new friends raved about the blueberry lemon muddy buddies flavor, it was an unexpected treat compared to the more traditional chocolate puppy chow treat served during the holidays. I loved that they didn’t melt in the summer evening heat. Are muddy buddies good for baking with kids? 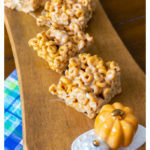 Any muddy buddies flavor would be a perfect simple treat for the kids to learn how to make by themselves. If they can melt butter and chocolate chips in a microwave safe bowl, then they can handle this dessert recipe. They will have a ton of fun pouring in the powdered sugar and shaking everything up to coat in a zip top baggie. Puppy chow is a great recipe for kids who want to be playful with flavor mixing, too. Though these blueberry lemon muddy buddies are great all by themselves, kids could have fun mixing in dried blueberries and silvered almonds or chopped pecans to make more of a sweet Chex mix of their own. This sweet Chex muddy buddies recipe is the perfect party dessert to bring to a potluck. The blueberry, lemon, and white chocolate muddy buddy flavor is a fun surprise for summertime gatherings. Place the blueberry flavored Chex into a large bowl. In a smaller microwave-safe bowl, microwave the baking chips, butter, lemon peel and juice uncovered for a total of 1 minute and 30 seconds on High. Be sure to stop every 30 seconds to stir so the chips don’t overcook and burn. Once everything is smooth and melted, pour it over the Chex and stir until it is evenly coated. Pour the Chex into a large gallon zip top bag and add the powdered sugar. Seal the bag and gently toss the cereal to coat. Spread the Chex out on a sheet of parchment or waxed paper to cool for about 30 minutes. Store in an airtight container.